The attic usually comes to mind first when considering home insulation. Since airflow in structures moves upward, it naturally pulls conditioned indoor air up through the attic and out of the home. Help keep conditioned air from escaping and keep your home at a comfortable temperature by making your attic energy efficient. 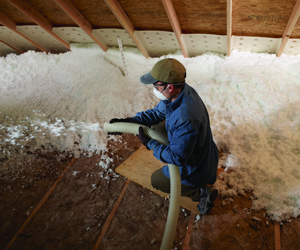 Blown-in fiberglass insulation added to an attic is a fast and easy way to increase R-value and is a cost effective option. This creates a complete thermal barrier in your attic to help keep heated (or cooled) air inside your home. Insulation and sealing air leaks significantly improves energy efficiency. After sealing penetration points around the attic floor, a layer of blown-in fiberglass insulation is installed. This process adds R-value and helps keep conditioned air from escaping your home. Spray foam insulation provides the best energy protection. When spray foam is applied along the roofline, it seals any air leaks and creates a thermal barrier along the ceiling of your attic. Spray foam is installed in one simple step and provides optimal energy benefits. If your home has existing fiberglass or cellulose insulation, spray foam insulation can be installed after removal of existing insulation. Installing or adding insulation in your attic is one of the most cost effective ways to reduce your energy bills. Uncertain about which insulation method is the right one for your new home or have questions about these three insulation options? We can help! Contact our office today!